If you are looking for a travel destination that offers a little of everything, you might want to consider Harrisburg. As the capital city of Pennsylvania, Harrisburg offers historic sites, nightlife, recreational activities and arts and culture. Read further to learn more about what you can see and do in Harrisburg, Pennsylvania. One of Harrisburg’s most shining attractions is its state capitol building. 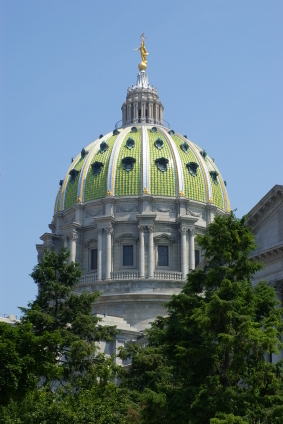 Modeled after St.Peter’s Basilica in Rome, Italy, the Pennsylvania State Capitol is a place well worth visiting to see its vaulted dome, beautiful sculptures, murals, elegant staircase and the painted floor tiles that illustrate the history of Pennsylvania. The National Civil War Museum is another of the city’s most popular attractions. Dedicated to telling the story of the American Civil War, this wonderful museum showcases a wide collection of more than 24,000 photographs, documents and artifacts that include uniforms, weapons and personal items like diaries and eating utensils. A few notable items on display are a lock of Abraham Lincoln’s hair, a Bible belonging to General Robert E. Lee, iron shackles formerly used on slaves, and a portion of Mary Todd Lincoln’s dress that she wore on the night of her husband’s assassination. A popular Harrisburg landmark, the Rockville Bridge is the world’s longest railroad bridge constructed with stone masonry. Built in 1902, the Rockville Bridge spans about 3,820 feet over the Susquehanna River. Another site well worth a visit is the historic Fort Hunter Mansion and Park. Here, you can tour the beautiful mansion, learn the interesting history of the area and enjoy picnics and scenic views of the nearby river and Rockville Bridge. A visit to the Broad Street Market is a must-do while in Harrisburg. At this colorful and lively market, you can shop for a bargain among 40 different vendors selling the likes of fresh produce, locally grown meats, homemade breads, pastries and handicrafts. While visiting in Harrisburg, you may enjoy watching a live performance in one of the city’s lovely venues. The Sunoco Performance Theater offers a wide range of productions from drama to ballet, opera and concerts. Situated within the State Capitol, The Forum is a beautiful lecture and concert hall where the Harrisburg Symphony Orchestra call home. The Whitaker Center is an interesting complex that offers a blend of performing arts and science exhibits. For sports and recreation, City Island is the place to be in Harrisburg. Located downtown nearby hotel accommodations, City Island is home to a minor league baseball team and a minor league soccer team. At this attractive city park, you can watch a ball game as well as engage in a variety of fun activities like miniature golf, batting cages, kayaking, canoeing, cycling, walking and arcades. Nightlife choices in Harrisburg range from sports grills and pubs to nice lounges. Some of the more popular hangouts include the Hilton Hotel Bar, the Harrisburg Midtown Arts Center and McGrath’s Pub, which is a local favorite. Harrisburg experiences four distinct seasons. While spring and fall are the most comfortable of the seasons, summers are usually hot and humid with occasional thunderstorms. Winters in Harrisburg can be quite cold with significant snowfalls. Don’t let any Harrisburg hotel deals slip past you. Check out the great offers that are available today and begin making your plans to visit Harrisburg, Pennsylvania.